Fake plants have a very bad reputation for being the poor relation of the real thing, but I’m very definitely not ashamed to say that I LOVE using them around my house – and I wanted to tell you why today! 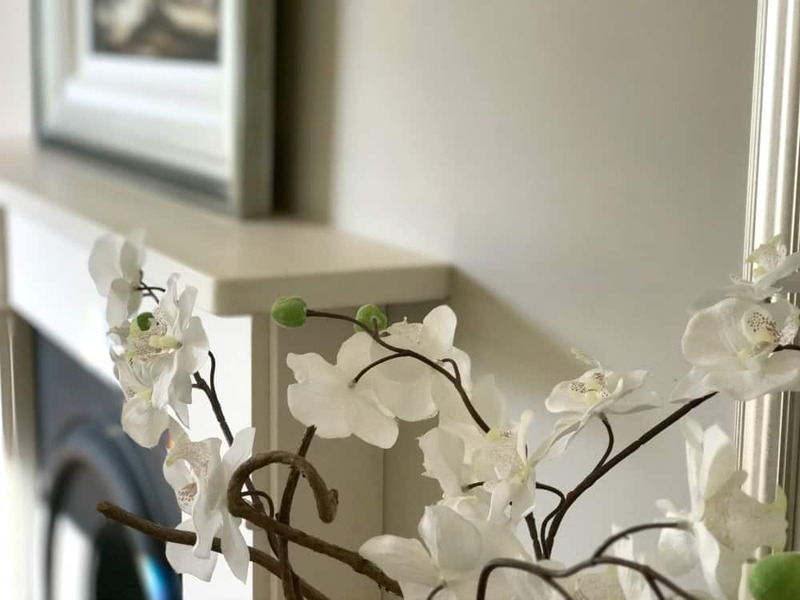 I have a bit of a thing for plants in my house – I love having greenery in every room as it adds a touch of colour, a bit of texture, real plants help to clean the air, and just look lovely! But – it’s taken a while to learn exactly what plants thrive in which rooms. Some rooms are hotter than others, some are darker, and some have more space etc…. Each room has it’s own needs, and it’s been quite a learning curve to get to the point I have (which is a semi-green fingered amateur at best!). I regularly have fresh flowers and plants in my house. 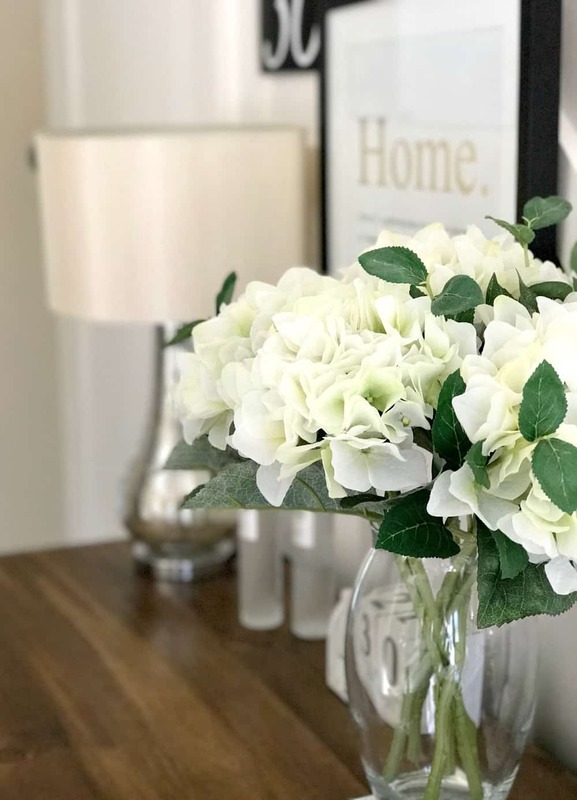 I used to think that flowers especially were far too much of a treat to just buy on a whim, but as I work from home I get to see them every day and they make me smile – and that’s worth a lot in my book! TIPS – One thing I have learned though is to buy when on sale at the end of the day from the supermarket, or grow and pick from the garden as this is less expensive overall. Even herbs make great pot plants for a touch of useful greenery in the kitchen! 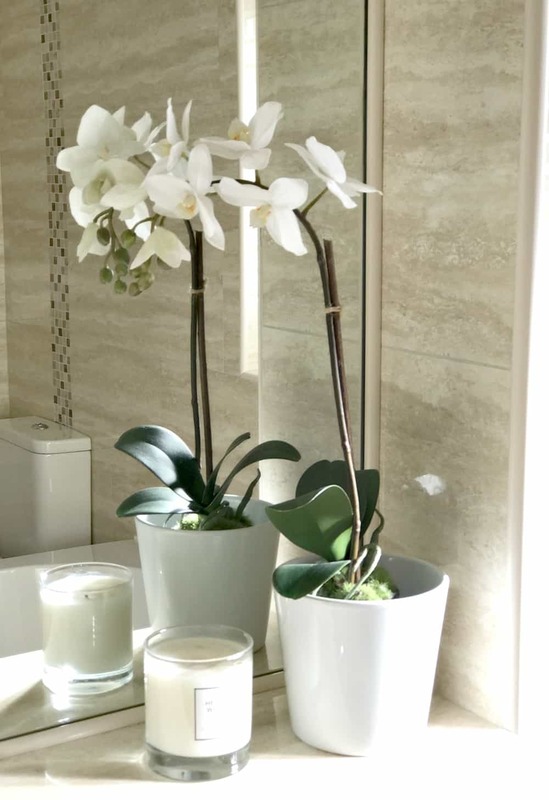 Although fresh plants are lovely, one thing that I started to find in my home was that some rooms in my house just weren’t giving me good results with real plants – however hard I tried – and so I started to turn my attention to artificial plants instead to see if they could compare. And I was very pleasantly surprised! WHY SHOULD YOU USE FAKE RATHER THAN REAL? Great for darker rooms – no worry that the sun won’t reach them to grow! 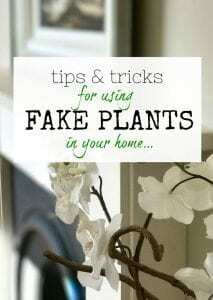 Great for if you don’t have green fingers – it’s hard to kill a fake! Great for your pocket – yes they may cost more at the start that a real plant, but they will last a lifetime! BUT FAKE PLANTS LOOK FAKE – DON’T THEY? Yes, there are some bad examples of fakes plants out there, usually the very cheap varieties, but if you look around you can find some real gems. You want to create the illusion of reality! WHAT FAKE PLANTS SHOULD I USE? One of my favourite fake plants is an orchid. 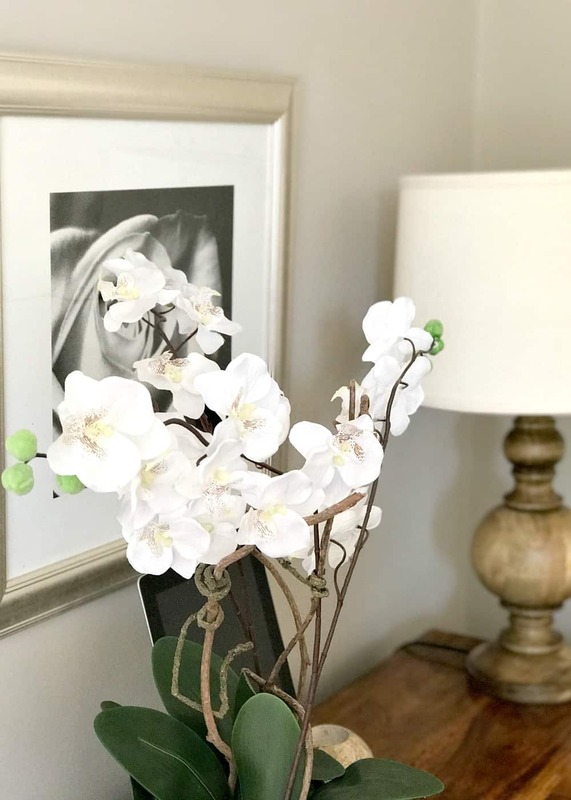 and I recently bought this larger orchid from Wayfair ** which is beautiful and lives in our rather dark living room corner. 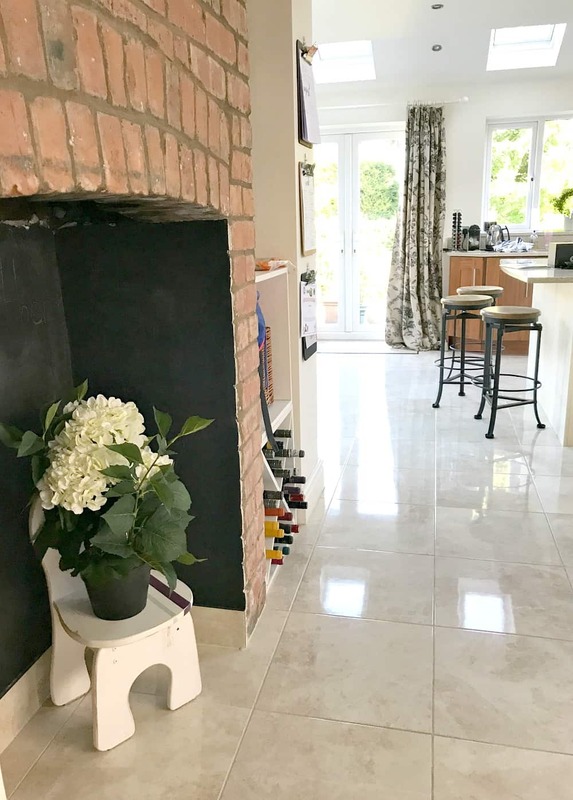 I also love to use fake flowers sometimes as well as plants – and these White Hydrangea from Marks and Spencer are simply gorgeous in our hallway (they aren’t currently available, but OKA do a good version as well). TIP – Use a mix of real and fake when it comes to flowers – you can get larger blooms that are fake and put them with sprigs of greenery from the garden – this makes flower arrangements even harder to spot unless you knew they were fake! Another favourite in our house is this hydrangea plant which I found in Sainsburys a few months ago. I am always on the look out for artificial plants and flowers so I was pleasantly surprised to find such a great looking plant in a supermarket at a great price as well! 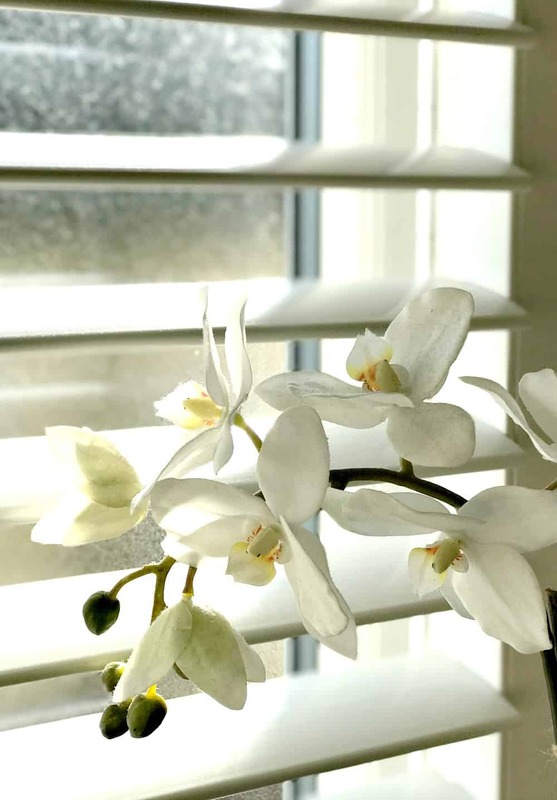 IKEA – love the little plants they do and I use them in sets of 3 on window sills quite often (these are currently in my office because it’s outside and gets a variety of high/low temperatures so wouldn’t be suitable for a real plant. HomeSense / TKMaxx – great value and lots of choice. John Lewis – I am currently in love with these artificial roses in a gorgeous container** – they may be on my Christmas wish list this year! … you can also get some lovely fake plants from lots of independent and smaller shops, so it pays to always be on the lookout! 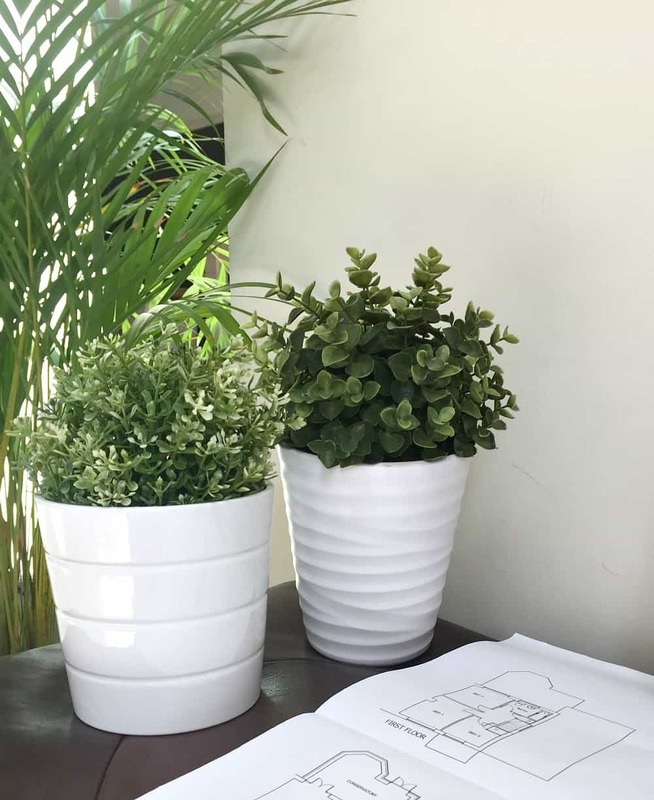 Overall, if you want a little bit of greenery in your home but haven’t the time or inclination to start gardening, then try fake and see how you go. Shop around for a realistic looking plant or flower – although these can cost more they work out as much cheaper over time than buying flowers or plants and having to replace frequently. Do you like fake plants? Do you use them in your own home? Would you start to now after reading this? I’d love to know, so please chat with me in the comments below…. Previous Post: « 6 TIPS TO CREATE THE PERFECT BATHROOM SCHEDULE – SO EVERYONE GETS A TURN! Hi Chrissy, I have just recently added some fake plants to my living plants in my home. I’ve done this for the reasons you mention, cost: fresh flowers- expensive in the long run, and also: dark areas where live plants don’t flourish. I have a dark, boring area at the top of some stairs in my open plan home and I’ve added a fake olive tree in a square concrete pot with real bark chippings where the soil would be, from Peony. It makes a real difference to be able to put a nice large piece of greenery in a place where nothing will grow. I still have my living plants in areas where they can flourish though! Hi Anne-Marie – that sounds perfect! Having a mix of real and artificial is the best way – then you get all the benefits of both!